What if an Old Lady got struck by green & red lightning bolts simultaneously? 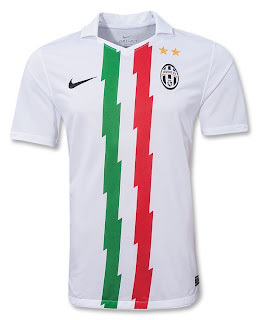 Official Nike Juventus 10/11 Away Soccer Jersey! This stylish retro shirt features two sublimated zigzag lines or lightning bolts down the center with embroidered Juventus team badge, two championship stars and Nike logo at front. No sponsor logo. Unlike the jerseys of old, this one is made of Nike’s advanced Sphere Dry & Dri-FIT® fabric.